For young surgeons, watching a procedure from from the sidelines and performing an operation with their own hands are two very different experiences. But one company is trying to remedy this experience gap with a new interactive virtual reality platform that lets surgeons and trainees virtually see and feel what it's like to perform specific operations. Yesterday London-based FundamentalVR launched its new software platform, Fundamental Surgery, that combines VR with haptic sensors. The platform gives users physical feedback simulating the feel of performing an operation. Each time a surgeon or trainee uses the software they first log in to their personalized account. This allows the system to track, assess, and give feedback to the user on their performance, including their instrument use, procedural accuracy, and patient impact. Users and administrators are able to go in and look at the student or clinician’s progress and assessments, then pinpoint areas that need work. Schools and hospitals using the software can run it on PCs or laptops, although it also requires a VR headset and two haptic arm devices. FundamentalVR’s SHIE software works with the haptic devices to give the user the sense of touch during the experience. The technology was designed so that users can get different physical feedback, such as what bone or skin feels like. The system can also switch up the surgeries so that the user must deal with possible “branch outcomes” like unexpected bleeding or a change in the patient’s condition. According to the company, the technology currently has an orthopedic focus but the team plans on expanding that lens to include laparoscopic, general surgery, cardiovascular, and otolaryngology experiences. In addition to the most recent launch, the company also offers mixed reality simulation, where the user wears a MultiMR HoloLens, which creates a holographic experience. Virtual operating rooms have been trending in the sphere of physician training tools. 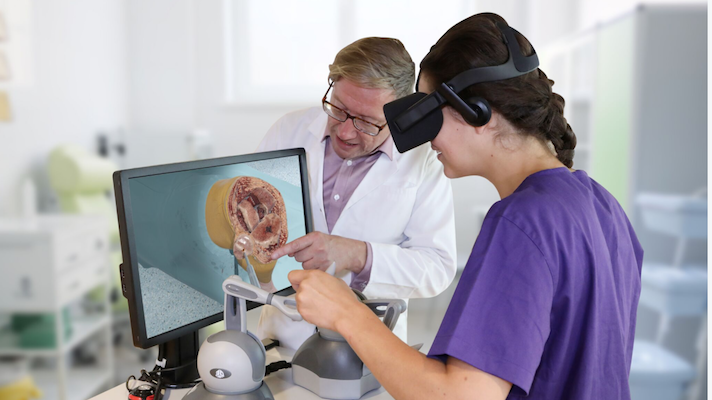 Last year Osso VR announced that it landed $2 million in seed funding for its VR technology that also lets surgeons practice. Last month, the same company announced that it was adding a multiplayer feature to its surgical training app, which would let surgeons work together in a single VR space, citing that multiple players is a norm in the gaming world. The University of Nebraska Medical Center jumped on the concept, announcing its plans to build a new $119 million facility meant to help physicians and nurses train for next-generation care using VR and augmented reality tools. That facility is expected to include a learning center dedicated to helping professionals conduct clinical training exercises and develop surgical skills through simulations technologies, VR and AR experiences, and holographic technologies.